We have another great recipe called Pecan Pilaf. 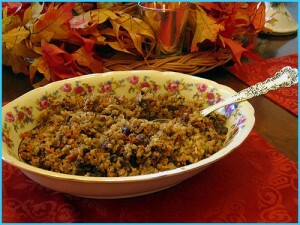 My mom made this for Thanksgiving; it tastes very, very yummy. A wonderful treat made from the favorite southern nut–pecans. Delicious as a side dish with pan-broiled chicken breast or fish fillet. Great as a left-overs. Melt 3 Tbsp. Butter in a large skillet. Add pecans and sauté 2-3 minu or until lightly browned. Transfer pecans to small bowl. Cover & Set aside. Melt remaining butter. Add onion & sauté 5 min or until tender. Add rice & stir 2 min or until evely coated. Bring water, broth, salt, & herbs to a boil in a saucepan. Add m ixture to rice. Cover, reduce heat to low & simmer 20 min or until liquid is absorbed. Add pecans & carrots. Fluff with a fork & serve.